Gallia Academy sophomore Alex Barnes, right, dribbles past Jackson defender Mariah Ridgeway during the first half of Monday night’s non-conference girls basketball contest in Centenary, Ohio. CENTENARY, Ohio — The Blue Angels dug a hole that they ultimately couldn’t get out of. 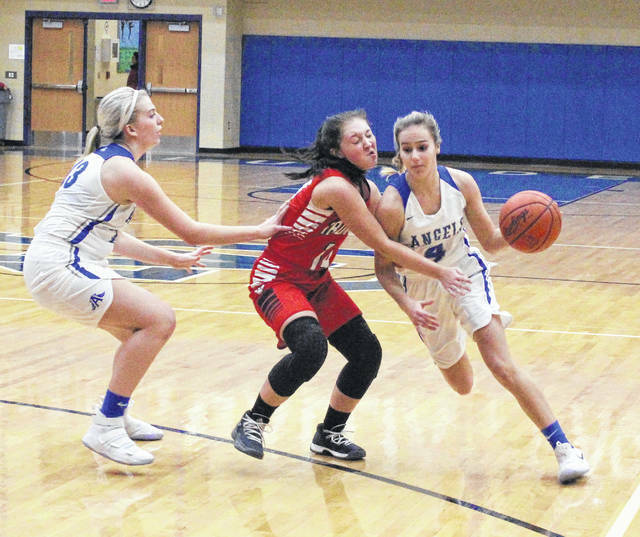 Visiting Jackson stormed out to a 24-9 first quarter lead and never looked back Monday night during a 57-41 victory over the Gallia Academy girls basketball team in a non-conference contest in Gallia County. The Ironladies (3-4) snapped a four-game losing skid by going on the offensive early, as the Red and White shot 60 percent from the field in the opening canto while building an early 15-point advantage. The host Blue Angels (4-4) were never closer than two possessions the rest of the way and were down by as many as 18 points at the end of the third frame, despite practically playing even with JHS over the final three periods. In the end, Jackson outscored the Blue and White by a single point after the first quarter while handing GAHS its fourth consecutive setback. The Blue Angels held the first lead of the night following a free throw from Alex Barnes 14 seconds into regulation, but Jackson answered by hitting five of its first seven shot attempts during an 11-0 run that led to a double-digit lead at the 4:57 mark of the opening canto. The Ironladies — who made 9-of-15 shots in the first period, including a 4-of-5 effort from three-point range — followed with a 13-8 run over the final 4:43 of the opener en route to building a 24-9 lead through eight minutes of play. Rebekah Green gave JHS its largest first half lead with a basket just 24 seconds into the second quarter at 26-9, but the hosts answered by hitting their first six shot attempts of the second canto as part of 15-2 surge that pulled the Blue and White back to within 28-24 with 3:35 remaining until halftime. The Blue Angels, however, were never closer as the Ironladies closed the final 3:13 of the first half on an 8-2 run that gave the guests a 36-26 edge headed into the intermission. The Red and White made a small 5-4 run out of the break to increase their lead out to 41-30 with 4:18 left, but the hosts were never closer in the third canto. JHS followed with a 9-2 surge the rest of the period to secure a 50-32 cushion headed into the finale. Jackson, however, went the final 9:28 of regulation without a field goal — including an 0-for-7 effort in the fourth — and the Blue Angels were able to make one last charge at getting back into the game. The hosts opened the fourth with 9-0 run that closed the gap down to 50-41 with 2:19 remaining, but eventually went scoreless the rest of the way. The Ironladies ended regulation with a 7-0 run that wrapped up the 16-point outcome. GAHS outrebounded the guests by a sizable 29-23 overall margin, which included a 13-9 edge on the offensive glass. 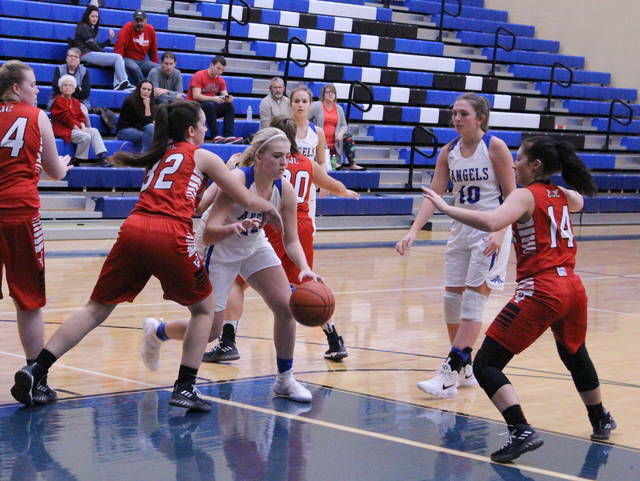 The Blue and White, however, committed seven turnovers in each half — compared to only five total by the Ironladies. 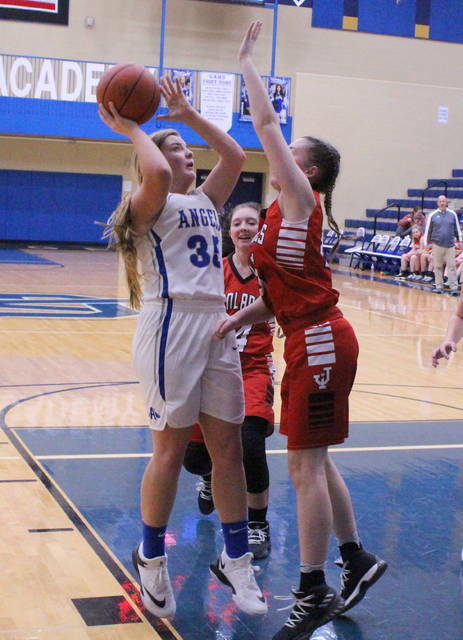 Gallia Academy connected on 15-of-44 shot attempts for 34 percent, including a 2-of-9 effort from behind the arc for 22 percent. The hosts were also 9-of-12 at the free throw line for 75 percent. Barnes led the Blue and White with 13 points, followed by Ryelee Sipple with nine points and Ashton Webb with six markers. Hunter Copley was next with five points, while Arianna Jordan, Katie Carpenter, Maddy Petro and Lilly Rees rounded the scoring out with two markers apiece. Sipple hauled in a game-high nine rebounds in the setback and Petro grabbed five caroms. Barnes and Copley also pulled in three boards each. Jackson netted 18-of-44 shot attempts for 41 percent, including a 5-of-10 effort from three-point range for 50 percent. The guests were also 16-of-20 at the charity stripe for 80 percent. Green led the Ironladies with a game-high 29 points, followed by Marley Haynes with nine points and Mariah Ridgeway with eight markers. Elizabeth Fout was next with five points, while Raegan Hall and Raylene Hammonds completed the winning tally with three markers apiece. Haynes led the guests with seven rebounds and Green grabbed another five boards for the victors. Fout also hauled in four caroms. Gallia Academy plays its final game of the 2017 calendar year on Saturday when it hosts Athens in a non-conference contest at 6:30 p.m.